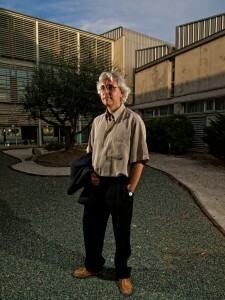 Joaquin Beltran is not Asian but he is a professor of Asian Studies at the University. I scouted around whilst waiting for him and found this interior space converted into a Japanese garden. it was latish in the afternoon so the sun was skimming across the roofs. I liked the muted colours we got with the combination of his clothes and the buildings, I used 2 strobes diametrically opposed sometimes with grids and sometimes bare. Usually in post production I tend to soften the quality of digital images, but with this one I used some tonal contrast to increase the hardness and texture, I was particularly keen to bring out the quality of the gravel and concrete of the building.